Following-up on information provided by the Georgia Department of Natural Resources (DNR), on June 27, 2006 this reporter investigated a recent Pomacea maculata discovery in downtown St. Marys in Camden County of far southeastern Georgia. The location in question is a rather small nondescript pond adjacent to State Road 40 near the site of the now closed Durango Paper Mill. Despite efforts by the DNR to extirpate this population, my visit confirmed that a viable breeding population of the snails was still present. This reporter then visited a second freshwater impoundment immediately adjacent to the towns aquatic center and a large breeding population of the snails was discovered there as well. This location had not been known to harbor a Pomacea population and was not previously investigated by the DNR. 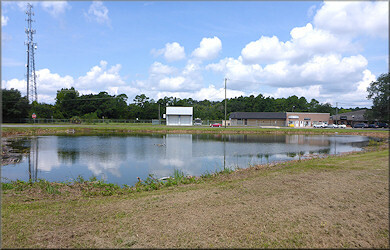 The impoundment is a medium sized lake located just south of State Road 40 near the St. Marys Public Library. Although a large number of Pomacea egg clutches were found all along the lake's shoreline, only five snails could be located despite a lengthy search. This lack of success was probably due in part to the high water level of the lake as well as the large amount of vegetation both along the bank and in the lake. It appeared that the lake was fed solely by run-off from the developed areas of the park and no existing outflow was found. However, a low area was located in the far southeastern corner of the lake where at times of very high water the impoundment had overflowed into an adjacent swamp. A single Pomacea egg clutch was observed on a tree trunk in the swamp indicating that a breeding population of snails was present there too. 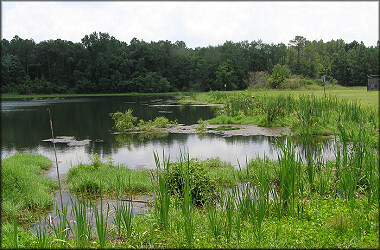 However, a follow-up visit some two months later during drier weather revealed that the swamp was totally dry, thus the snails likely are not present there during the entire year. A follow-up visit was made to the aquatic center lake on June 29th, a more thorough investigation was conducted and a total of 20 specimens were collected and measured. Of the group the smallest measured 60 mm. 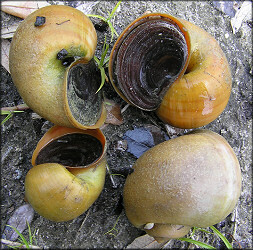 (three specimens - probably males); the largest measured 79 mm. 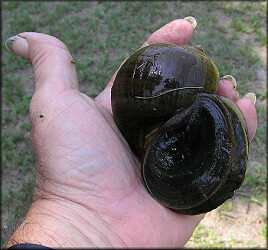 (two specimens); and the average size was 71 mm. Of the 20 specimens, 15 measured over 70 mm. Interestingly, even the largest specimens appeared to be in their prime and actively growing - an observation made previously in regards to 80-plus mm. specimens from the paper mill pond. The swamp adjacent to the lake was also revisited and three additional Pomacea egg clutches were observed confirming that at least a modest breeding population is present. On June 27, 2007 (exactly one year after the initial visit) a survey was made of both Pomacea habitats in St. Marys and the snails at both locations were engaged in mating and depositing egg clutches. During the preceding year both locations had been visited on at least a monthly basis and occasionally several times each month. During this period the snail population at the paper mill pond significantly diminished probably due to very low water and a general lack of food while at the aquatic center lake the population literally exploded with many of the adults growing to an impressive size. The largest specimen found at the aquatic center lake during the year measured 97 mm. but 85-92 mm. specimens were not uncommon. Monitoring of the two locations continues.